I love pumpkin. Each fall, I buy anything & everything that is pumpkin flavoured. Coffee, breads, candles, soaps. I just couldn't get enough. Then with the transition from fall to winter, pumpkin was moved to the back burner. 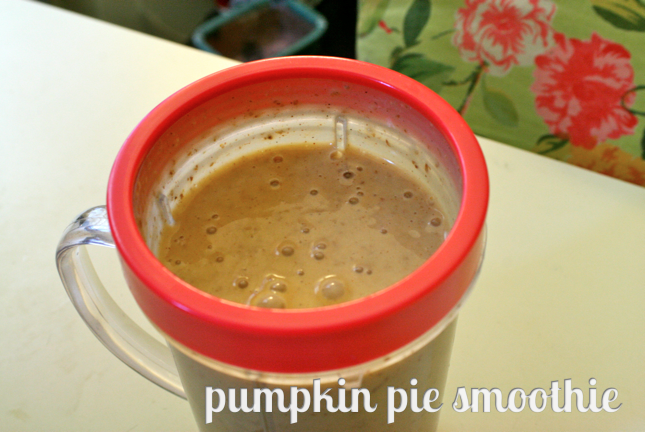 This January I am bringing back my love of pumpkin with this smoothie recipe. I have been making this smoothie constantly! It tastes like a delicious dessert but is packed with vitamins, healthy fats, protein, and fiber. I'll have it with my lunch (shown below with a fake chicken caesar salad) or as an afternoon or after dinner snack. Do you love smoothies? What are some of your favourite combinations? I tend to also make berry smoothies a lot, but I haven't quite mastered the green smoothie yet!